September 11th Survivor Tree - The Massachusetts 9/11 Fund, Inc. 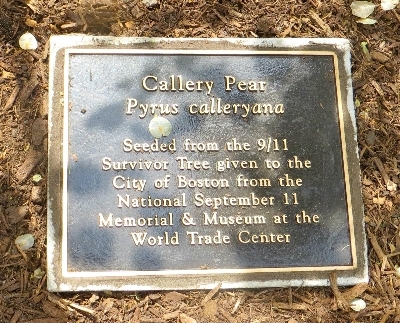 The Garden of Remembrance in the Boston Public Garden is now the home of a sapling cultivated from the September 11th Survivor Tree found at Ground Zero. On Monday, May 19, 2014, Mass 9/11 family members joined Mayor Martin Walsh for the dedication ceremony. Mayor Walsh unveiled a plaque that explains the significance of the tree to the City of Boston and the greater Boston community. The tree and plaque are located next to the Boston 9/11 Memorial. The gifting of children of the Survivor Tree by the City of New York and the National September 11 Memorial and Museum is a tradition in the making. Four hundred and fifty gifts to communities affected by profound tragedies are planned. In recognition of September 11th and the Boston Marathon bombing in April 2013, Boston is one of the initial recipients of a child Survivor Tree. We share this honor with Prescott, Arizona, which lost 19 firefighters who died fighting a wildfire in June, 2013, and the Far Rockaway neighborhood in Queens, New York, which is still reeling from the effects of Superstorm Sandy in October 2012.